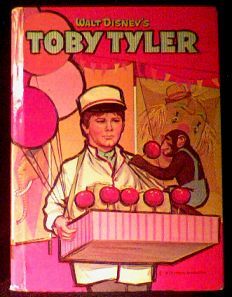 Whitman Disney novel featuring Toby and his pet monkee on the cover. Book corners have minor wear, and child's name is written in pencil on bookplate inside cover. Solid binding. Unfortunately, all of these types of books were not printed on acid-free paper and you will almost always find some yellowing of the pages (the older they are, the more yellowing), especially near the edges. Website design and hosting by Sohodojo Business Services. Item 437 of 466 items displayed in viewer. 0 items in cart.